“The world is focused on Indian aviation – from manufacturers, tourism boards, airlines and global businesses to individual travellers, shippers and businessmen. If we can find common purpose among all stakeholders in Indian aviation, a bright future is at hand.” – Tony Tyler, Director General and CEO, International Air Transport Association (IATA). In 2015-16, Indian domestic passenger traffic has shown an increase of 21.2% as compared to 2014-15. When compared to the global average growth of 6.7% in the same period this is highly impressive. The domestic aircraft movement too has shown an increase of 12.8% as compared to 2014-15. While the remarkable growth figures have earned India the crown of ‘being the fastest growing aviation market in the world’, the moot question is how long can this crown be retained? The poor state of airport infrastructure is highlighted by the fact that the country has one airport to every eight million citizens, as compared to one airport to every 170,000 citizens in USA (See Table). The disparity is huge even if one gives consideration to difference in population densities of the two countries. Between now and 2039, we could add another billion people to the global middle class and consume a whopping 23% of global middle class consumption. The rising disposable income and aspirations for a better lifestyle is likely to make this set of people the primary drivers of air traffic growth. Even the asymmetrical traffic pattern at airports is a matter of concern. In 2015-16, the ten busiest airports handled 78% of the total passenger traffic and 74% of the total aircraft movement in the country. These airports are located at the metros and Tier 1 cities, leaving vast swabs of hinterland underserved. Such unbalanced growth of traffic will soon saturate the busiest airports while smaller airports will continue to remain in a state of disuse. The lack of inclusive growth in air traffic can be a dampener to rapid aviation market growth in India. In my opinion, this is the single biggest challenge that will be faced by the Indian aviation sector in coming years. India has added 6.7 million adults to the middle class between 2000 and 2015. Between now and 2039, we could add another billion people to the global middle class and consume a whopping 23% of global middle class consumption. The rising disposable income and aspirations for a better lifestyle is likely to make this set of people the primary drivers of air traffic growth. Residing mostly in Tier 3 cities, this group will have economic necessity to connect with Tier 1 cities having big jobs, big businesses and international gateways. The surging demand for regional connectivity is currently being met by rail and road. For air travel to become the primary choice for such connectivity, inclusive growth in infrastructure located within easy reach of such commuters is a must. Type B: Connectivity with large Metros (Tier 1 cities) such as Delhi, Mumbai, Bengaluru and Hyderabad. A time tested model is of a regional hub in provincial capitals with spokes in numerous Tier 3 cities; while simultaneously having a metro hub in Tier-1 cities with spokes in provincial capitals. The regional hubs would be established by regional operators like Air Pegasus and Truejet, utilising propeller aircraft that require lower maintenance and shorter runways but also with lower passenger capacity. The metro hubs would be supported by scheduled commercial airlines like Indigo, Jet and Vistara having high capacity, high maintenance aircraft. Achieving connectivity between Tier 3 and Tier 1 cities is an uphill task as Tier-1 Airports in India are thoroughly congested and getting more so. A traveller from say, Gaggal (Himachal) wishing to travel to Delhi will have to first come to a Tier 2 city, say Chandigarh through regional airlines like Air Pegasus or TruJet. Aggregation of travellers from various Tier 3 cities will take place at regional hub and a national airline like Indigo will ferry them to Delhi. Code sharing could be done by specific regional and national airlines to enable seamless transfers at regional hubs. While the value proposition for commuters in Metro hubs would be both facilities and fares; in regional hubs it would exclusively be rock bottom fares. Hence Tier 3 cities would be best served by Low Cost Airports (LCAs) that can have facades similar to school gymnasiums with no frills, no air-conditioning and no parking charges. Such airports will also have less manpower, use close-circuit cameras and motion detectors, and do away with X-ray machines, aerobridges, and buses for travellers. Free land, aircraft centric security and firefighting services could be provided by state governments to drive down operating costs. To make regional hubs more cost-effective, one may consider co-locating heliports with such airports. Regulatory relaxations in National Civil Aviation Policy are likely to popularise helicopter services, and with better penetration of remote areas they will have a positive effect on commuter traffic. Commuters will travel by air only if ‘convenience and fares’ are competitive to other modes of travel. A lesson can be drawn from the strategy utilised by ‘Uber’ to transform luxury to necessity through astute leverage of subsidies and technology. Commuters will travel by air only if ‘convenience and fares’ are competitive to other modes of travel. A lesson can be drawn from the strategy utilised by ‘Uber’ to transform luxury to necessity through astute leverage of subsidies and technology. When Uber entered the Indian market in 2014, travel by cabs was considered to be ‘upscale’ and auto rickshaws were the norm. Using deep pockets, Uber provided cabs to travellers at the price point of an auto rickshaw and ensured their regular availability by incentivising cab drivers. Technology was exploited for providing ease of convenience. This strategy has made cabs an essential part of a commuter’s life and hailing a cab no more generates pangs of guilt. It is eminently clear that at current price points, the Uber model does not have long term sustainability. The company will either have to raise fares or find other revenue streams. However, when Uber does raise fares loyalty of commuters would be retained by ‘force of habit’, and due to the overwhelming convenience they experience in comparison to other means of travel. The government is well aware of the situation and has come out with the National Civil Aviation Policy (NCAP) 2016 to provide a solution for all stakeholders. The policy push has set the stage for development of low cost airports and improvement of existing ones through enhanced private sector participation and modernisation drive by the combination of Airports Authority of India and state governments. 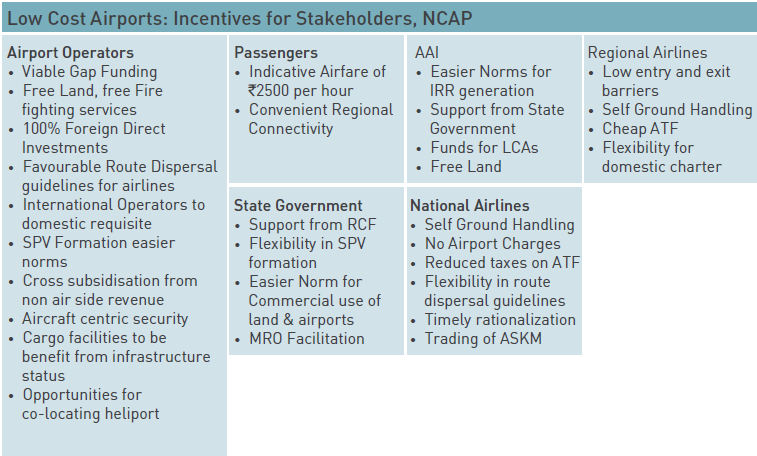 The NCAP has addressed key issues by introducing guidelines for regional connectivity scheme, regional connectivity fund, viability gap funding, route dispersal guidelines, easing of entry barriers for regional airlines, code sharing and trading of available seat kilometres, easing of IRR requirements for greenfield airports, simplified cargo operations, relaxed norms for helicopters and 100% FDI norms. The Airports Authority of India (AAI), State Governments and private players have been encouraged to become partners in the aviation growth story. Such an approach will diffuse risks and promote inclusive growth. However, the key lies in execution. The broad canvas of incentives to stakeholders is displayed in the table below. The policy push has set the stage for development of low cost airports and improvement of existing ones through enhanced private sector participation and modernisation drive by the combination of Airports Authority of India (AAI) and state governments. The success of LCAs will depend on the durability of the business models. The airfare charged by airlines is dependent on a number of variables, the most prominent being fixed costs and fuel charges. While the latter is dependent on global dynamics, fixed costs can be reduced by minimising charges levied by airports. Efficient low cost airports with resilient business models can bring in immense cost reductions that can further be passed on to airlines. Globally, governments have realised the advantages of privatisation of aviation infrastructure for efficiency and cost reduction. Privatisation need not imply sale of property. The most practical scenario would be for a government to retain control over the type of facilities to be developed; while private operators oversee routine operations of the airport. As shown by Guislain and Kerf,( 1995), the degree of privatisation may vary from supply and civil works, to management contracts to complete transfer of property (Divestiture). The degree of risk sharing thus changes in increasing order from public to private ownership. The above models work well in areas with established air traffic. However, private players are disinclined to invest in remote areas with static traffic growth. Till such time a minimum threshold of traffic is achieved, such investors have to be compensated by subsidies, soft loans and equity participation. Innovative models to overcome capital shortage are the order of the day. The airfare charged by airlines is dependent on a number of variables, the most prominent being fixed costs and fuel charges. While the latter is dependent on global dynamics, fixed costs can be reduced by minimising charges levied by airports. 1. While the PPP models in five airports (Delhi, Mumbai, Bengaluru, Hyderabad and Kochi) established by AAI with private operators have overall been profit making and providing as much as 60% of the total revenues, 93% of airports wholly owned by AAI have made losses. According to the profitability statements of airports managed by AAI, eight airports registered profits in 2013-14. Considering the demonstrated success of PPP models, privatisation of above AAI managed airports in PPP mode is recommended. Revenue generated from these airports can be utilised towards LCAs. Such LCAs can then be put under management contracts with private operators for extended durations. On achieving commercial viability, these airports could then be brought under the PPP umbrella. 2. The government has not been using financial instruments for funding LCAs. Introduction of tax-free bonds against future earnings of the airports can be a low cost source of funds. 3. AAI can have long term partnerships with individual airlines for funding of LCAs. Airlines contributing to specific LCAs can have long term exclusive rights at these airports including naming rights. These arrangements would be mutually beneficial to both stakeholders. The airline can make it a low cost hub, while airport operator would have assured traffic. 4. Airports at regional hubs like Jaipur, Chandigarh, Bhopal, Pune amongst others can also serve as ‘Fulfillment Centres’ of ecommerce companies. Cargo operations by regional airlines can generate substantial non-airside revenues to compensate for fixed costs. 5. Defence Offsets have the potential of bringing in billions of dollars from OEMs in joint ventures with Indian companies. Currently, this investment can only be utilised in defence related projects. Investment in airport infrastructure can be made an acceptable means of discharging offset obligations, thus making vast funds available for the purpose. 6. Regional airlines ought to develop deep understanding of needs of local businessmen/ commuters by adopting a customer first approach. For e.g., a local vendor carrying excess baggage in relation to metro commuters. Enabling higher baggage allowances for such commuters will provide disproportionate gains in commuter traffic. The success story of Indian aviation will depend on two primary drivers; low fares and increased connectivity. Low fares can be sustained by alternate revenue streams and innovative utilisation of tax payer’s money. Improved connectivity can be obtained by no frill airports that connect to each other through airline hubs. SouthWest airlines successfully identified the requirements of local commuters and designed their model around these needs. They are one of the most successful airlines in the world. A similar customer first approach by our Low cost airports and regional airlines can yield rich dividends. It is time for Indian aviation industry to compete with Indian Railways. Guislain P, Kerf M (1995) Concessions: The way to privatize Infrastructure sector monopolies, World Bank Report.